Not based on any testing of my own, this info comes from a man in Austria named Robert. 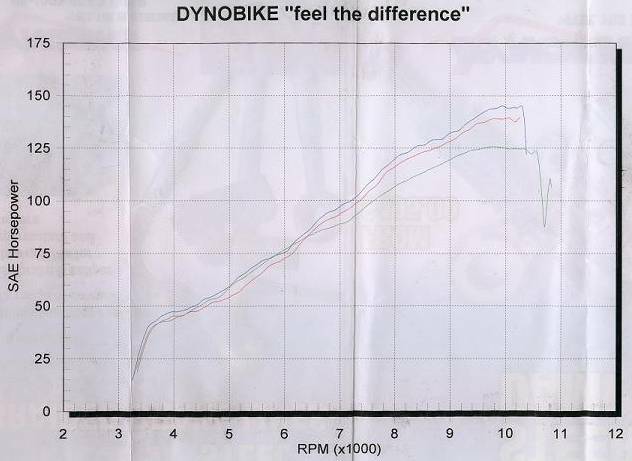 He sent me an email with a dyno chart from his 999S, and I thought others would be interested to see it. I give no guarantee of its accuracy, but I have no reason to doubt it either. He seems a pretty straight up kind of bloke, and certainly into his 999S. He was talking 749R cams for the future, so thatd be interesting to see too. Im not sure what type of dyno he is using, or what scale the numbers are in, but thats not so important. Back to backs on the same bike are always good to see, and its not often you get to try them. Especially when the components youre testing cost as much as the big 2-1-2 systems do. I assume the power and torque curves are crossing at 5,250 RPM, so you can see the 54mm system has some more under 5,000 RPM and a little more between 9,000 odd and the rev limiter. Not that its that much, but certainly there. So, one mans result. As usual, your results may vary. But it’s a graph I appreciate seeing. And it goes along with my usual scepticism of big exhausts. Pity Robert didn’t get his hands on a 50mm system to test as well. Update Feb ’05 with results from another bike local to us, but again not my testing. Update to the update: I have been told that there is more to this than I knew, so I’ll add what was posted on a Ducati forum by someone who knows much more about this bike than me (not the owner). The info on Rob’s bike is not correct. The test, for example with my 57mm installed was done with his standard ECU (asymmetrical), not the 57mm or 57mm Corse. 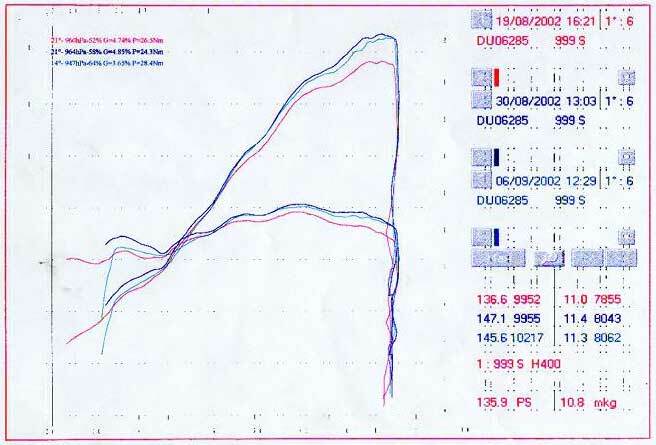 The dyno test on the 54mm system was with the correct 54mm ECU. He subsequently borrowed one of my Corse ECU's, which must have worked, because he has asked to buy one from me. Bottom line is the conclusion that the 54mm system produces more power than the 57mm system on a warmed over 999 is completely incorrect and contrary to previous back to back tests performed. So factor this into the following info and make of it what you will. It’s not my work and I wouldn’t have posted it if I’d known what I didn’t. One of our customers has done this experiment also on his 999S. I had done the cam timing on this bike when it was purchased and it had an asymmetric system fitted. The owner then decided to have a play, doing some head work, setting the squish properly, changing the cam timing a little back toward std specs and fitting some big carbon air runners. He also fitted a 57mm 2-1-2 system. After that he tried a 54mm system to see if it helped the bottom end. It did. The graph below shows the 3 stages this bike has been in. Green is as the bike was initially with the asymmetric system, red is after the owner’s work with the 57mm system and blue is after the owner’s mods with the 54mm system. Here the 54mm 2-1-2 system makes more power all through the RPM range, with the bottom end improvement being particularly noticeable to the owner. In this state of tune it’s a very nice engine to use, and a rather quick bike. Dynograph courtesy of Dynobike (03) 9553 0018 and Rob Wallace.